Tijin Thankachen and Silpa are photographed in a canoe in the Pamba river in Kadammanitta, the south Indian state of Kerala. But when Tijin leans in for a kiss the boat topples over. Daily Mail. Fri, 19 Apr 2019 19:40:23 +0100. ABC News. Fri, 19 Apr 2019 08:15:26 -0400. Yahoo. Thu, 18 Apr 2019 11:52:13 -0400. BBC News. Thu, 18 Apr 2019 14:26:42 GMT. New York Times. Thu, 18 Apr 2019 11:24:47 GMT. Al Jazeera. Thu, 18 Apr 2019 08:32:17 GMT. Fox News. Thu, 18 Apr 2019 00:15:26 GMT. Sky News. Wed, 17 Apr 2019 07:20:00 +0100. Voice of America. Tue, 16 Apr 2019 21:40:03 -0400. Radio Liberty. Wed, 17 Apr 2019 01:28:05 +0000. Dave Boyer. Washington Times. Tue, 16 Apr 2019 20:00:15 -0400. Jeremy Binnie, London. Janes 360. Wed, 17 Apr 2019 00:00:00 GMT. A 9-year-old girl won $1 million in a Dubai lottery Tuesday, years after she had already won a McLaren Coupe car valued at over $261,000, according to The Daily Mail. Newsmax. Tue, 16 Apr 2019 13:17:34 EDT. Tass. Mon, 15 Apr 2019 19:07:37 +0300. Hsyndicate. Mon, 15 Apr 2019 10:27:04 +0200. Washington Times. Sun, 14 Apr 2019 21:17:44 -0400. By Elena Zavelev, Contributor. Forbes. Thu, 11 Apr 2019 18:00:00 +0000. 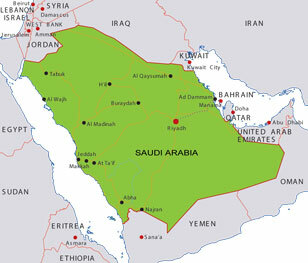 The Arabian Peninsula is located in southwestern Asia, in a region known as the Middle East. Nations on the Arabian Peninsula include Saudi Arabia, Bahrain, and Kuwait, as well as Oman, Qatar, Yemen, and the United Arab Emirates. To the northwest of the peninsula lie the Arab States of Jordan, Lebanon, and Syria. Arabic is the primary language of these States. More news and information about selected Arab nations is available at the official government websites listed below. The Kingdom of Saudi Arabia's capital city is Riyadh, and its national currency is the Saudi Arabian Riyal. In 2007, the population of Saudi Arabia was estimated at 27,601,000. The Kingdom of Bahrain's capital city is Manama, and its national currency is the Bahrain Dinar. The estimated population of Bahrain in 2007 was 709,000. The Hashemite Kingdom of Jordan's capital city is Amman, and its national currency is the Jordanian Dinar. In 2007, the population of Jordan was estimated at 6,053,000. The State of Kuwait's capital city is Kuwait City, and its national currency is the Kuwaiti Dinar. The estimated population of Kuwait in 2007 was 2,506,000. The Republic of Lebanon's capital city is Beirut, and its national currency is the Lebanese Pound. In 2007, the population of Lebanon was estimated at 3,926,000. The Sultanate of Oman's capital city is Muscat, and its national currency is the Omani Real. The estimated population of Oman in 2007 was 3,205,000. The State of Qatar's capital city is Doha, and its national currency is the Qatari Riyal. Qatar's estimated population in 2007 was 907,000. The United Arab Emirates' capital city is Abu Dhabi, and its national currency is the Dirham. In 2007, the UAE's estimated population was 4,444,000. The Republic of Yemen's capital city is San'a, and its national currency is the Yemeni Riyal. Yemen's population in 2007 was estimated at about 22,231,000.